By Ross Elliott - posted Wednesday, 9 September 2015 Sign Up for free e-mail updates! Lately there's been much attention on the fortunes of Australia's major trading partner – China – and with good reason. But very little of that attention has focussed on a problem that's potentially much bigger than a 'crash' in China's economic growth to 'just' 4% or 5% GDP. China, population one thousand four hundred million people, may not have enough people. What? Seriously? The world's most populated nation, with such a rapid rate of population growth that it infamously introduced a "one child" policy under the Communist regime to keep its population in check, and it may not have enough people? In truth, China actually has plenty of people. But thanks in part to the impact of the one child policy on its demography, it is fast going to find itself with a shortage of working age people relative to the number of young and elderly who will rely on those of working age for their taxes and other forms of support. Introduced in the late 1970s, the one child policy was an experiment in totalitarian control. China's birth rate fell from over 5 to just over 1.5 compared with a birth rate of 2.2 needed for any nation to sustain its population numbers. Most of that fall in fertility however occurred before the one child policy took effect, as the country began its transition from a rural economy where large families were an economic necessity to an increasingly urban economy where large families are hard to house. Chinese families over time have also shown a preference for boys over girls: again because of perceived economic benefit. In 2014, there were 100 female babies to every 114 males, well out of kilter. Sadly, infanticide is a factor. This also works against higher rates of population growth. China's rate of population growth peaked at around 2.74% in 1970. It has fallen rapidly since then and today stands at around 0.61%. 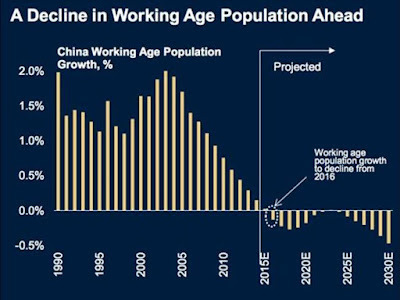 The prediction is that this will fall to zero by around 2030 from which point on the total population of China will be in decline. The one child policy was officially relaxed in 2013 so that most couples are now allowed a second child but the impact on China's working age population from this rapid deceleration of population growth is already being felt. Last year, China's working age population fell by 3.7 million people: the third successive year of falls. And the falls are set to grow: according to a report by Business Spectator, the Chinese Academy of Social Sciences claims that between 2020 and 2030 the Chinese labour force will fall by almost 8 million every year, and from 2030 to 2050 it will fall by 8.35 million, every year. Think of what all this means for a moment. We've been told of a miracle economy, rapidly urbanising and spewing out upwardly mobile middle class consumers at rates we can't comprehend. But at the same time, the working population is shrinking, and that rate of shrinkage is set to increase significantly. Not only that but our perception of China is that of a fast growing population. But the facts are that China is about to stop growing and start shrinking within the next ten to fifteen years. We are currently seeing China at its historic biggest. This can only mean that for China to continue to grow its economy at solid rates of expansion, it will need to do so on the back of rapid gains in in productivity from a shrinking labour force. Increasing urbanisation may help drive productivity and greater value adding as the economy increasingly transitions from rural production to an urban manufacturing and services economy, but it's hard to ignore the demographic picture. The saving grace on this is the Chinese are far more resilient and independent than we Australians. This might sound an odd way to describe a Communist nation but the sorts of welfare systems we have put in place in Australia are alien to the Chinese. They are far more likely to support extended family (parents and grandparents as a minimum) without state welfare reliance. This is a cultural value which transcends politics. Their work ethic, family ethic and savings ethic are humbling by Australian standards. Which means that while this sort of demographic trend would be poison for Australia, it is not necessarily quite so poisonous for China. Ironically, Australia faces a similar demographic problem in the future, as ageing baby boomers and Gen Xers become increasingly reliant on a shrinking pool of working age Gen Ys and millennials to pay for very generous taxpayer funded pension and health benefits. There is a marked difference in scale between the two countries but I am betting that the cultural values of the Chinese will see their economy survive this demographic time bomb, while Australia may sink under the weight of its numerically much smaller burden. If we can't even manage to agree to a $5 co-payment for free GP visits, how will we have the foresight to get our health and welfare systems into check before the inevitable demographic shift begins to be felt here in earnest?